The civil holiday of Thanksgiving is a wonderful reminder to us of the need to thank God for all that we take for granted; for all that we have had, and all that we think we will have in the future; for our churches, for our priests and matushkas, for our parishioners. 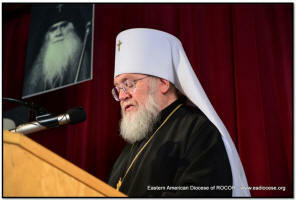 This Thanksgiving, I especially thanked the Lord for all of you – the members of the Russian Orthodox Church Abroad. Thank God for our parishioners! Without the bishop there is no Church, but without the parishioners, there is no parish and no community in which we all might care for one another. This year, many of our lives were turned upside-down: some of us suffered from catastrophic natural disasters, while others of us lost our source of employment. Both laymen and clergy suffered – that is, our whole Church. Today, on Thanksgiving, I ask you all to support the Church, giving an especially generous donation to the Fund for Her Assistance – assistance to the Church Abroad. For more than half a century, this organization has been supporting clergy in need, our youth, and those suffering from the effects of natural disasters. Our Church is small, but we will survive if we apply every effort to support one another and those in need. Even a small donation of just $10 can help a poor family send their child to St. Herman’s Conference, can buy bread for one of our priests in need, or pay for a week’s rent for one of our Church members in Haiti or Uganda. I fervently ask your generosity and help for our Holy Church through the Fund for Assistance! May all those in need who receive your help pray alongside me for their benefactors, saying: Thank God for our Church! Thank God for the kindheartedness of our parishioners! Please click here to donate to the Fund for Assistance!